Here’s a confession that should surprise no one: I personally find the Mac App Store pretty much useless. To me, it seems little more than a way for Apple to extract money from developers, in exchange for the dubious “favor” of controlling what apps are allowed to do on my computer. And as for the App Store application, it seems to be modeled on the worst features of the iTunes Store interface, a winky-blinky antithesis of usefulness. At its best, the Mac App Store might at least offer a cornucopia of apps for new users to find and use to extend their Macs, but the App Store application, by making apps difficult to discover, turns the Mac App Store into something more like an app graveyard where only a few featured or popular apps bubble to the top and everything else languishes in obscurity. But what a difference an interface makes! Appalicious, a newly released application from ProVUE (makers of Panorama and Panorama Sheets; see “ProVUE’s Panorama Gets a Baby Brother: Panorama Sheets,” 7 January 2011), puts a whole new face on the Mac App Store. In doing so, it actually succeeds in making the Mac App Store useful for people like me who want to go beyond browsing with a couple of clicks. The power of Appalicious comes in two parts. First, there is ProVUE’s online database that records information about all the apps in the U.S. Mac App Store. This database knows not only the current facts about the available apps, but also the historical facts about them; thus, it knows (for example) the changes over time in each app’s pricing. The screenshots below give some indication of what I mean (they come from the Appalicious Web site, not Appalicious itself). 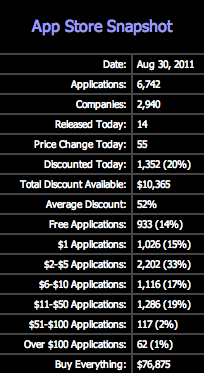 In the first screenshot, we learn that the U.S. Mac App Store currently holds 6,742 applications from 2,940 companies, of which 933 are free, and of which 1,352 are being sold today at a discount from an earlier price. In the second screenshot, we see some details about those discounts. Second, there’s Appalicious itself. It is, of course, an application on your Mac. When you run it, it downloads the data about the apps in the Mac App Store from the online database, and presents those data to you using the full database power of Panorama’s super-speedy in-memory database engine. That means you can instantly search, sort, and filter the list of available apps, to see just those you’re interested in. For example, in the screenshot below, showing the main Appalicious window, I’ve filtered the list to show just those apps currently selling at a discount of 75 percent or more, and then I’ve sorted the list to show first those apps that have been awarded the most stars by users. Needless to say, gleaning this kind of information from the App Store application would be utterly impossible. 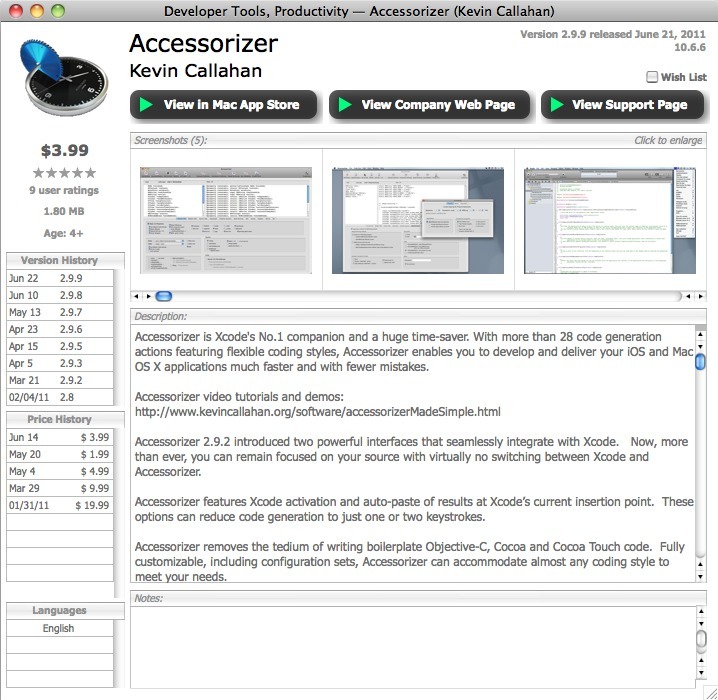 A secondary Appalicious window (called the detail window) displays additional information about an app. For example, in the screenshot below, I’ve double-clicked the listing for the first app in the main Appalicious window, thus bringing up a detail window describing that app, which is called Accessorizer. The window displays the screen shots and description from the Mac App Store entry; you can click a screen shot to see a full-size version. Note also the historical information shown down the left side of the window: for example, we learn that this app once cost $19.99, and that its price was later lowered to $9.99 and has gone as low as $1.99 before settling on its current price of $3.99. (Such is the power of the historical Mac App Store data stored in ProVUE’s online database that one can almost sense the developer experimenting to find the sweet spot at which the app will sell best while earning a reasonable return.) If I decide to purchase and download this app, a button near the top left of the window (View in Mac App Store) lets me switch to the App Store application, where I can do so. Another thing I greatly appreciate about Appalicious is the extent to which it puts the power into the hands of the user. For example, in Appalicious’s detail window, notice the field at the bottom where I can enter my own notes about this app. And back in the main Appalicious window, not only can I choose what columns to display, create simple or complex custom searches, and perform simple or multiple sorts, I can also create and maintain customized settings for each of those things, making a set of columns, a search, or a sort into a “favorite” that can be put into effect instantly by choosing from a menu. Indeed, Appalicious comes with numerous built-in preset searches and sorts, so that (for example) I can instantly see apps that are “On Sale 5 Stars” or “Huge Downloads” or “Free (Recent)”. In addition, Appalicious keeps track of what apps I’ve recently viewed in the detail window, and enables me to put apps into a wish list. Even this brief description should give you a sense of Appalicious. There really isn’t that much more to know about it, and what there is, you can easily discover for yourself. Appalicious comes with excellent online help, and is also backed by an excellent introductory guided tour and a bunch of screencasts. 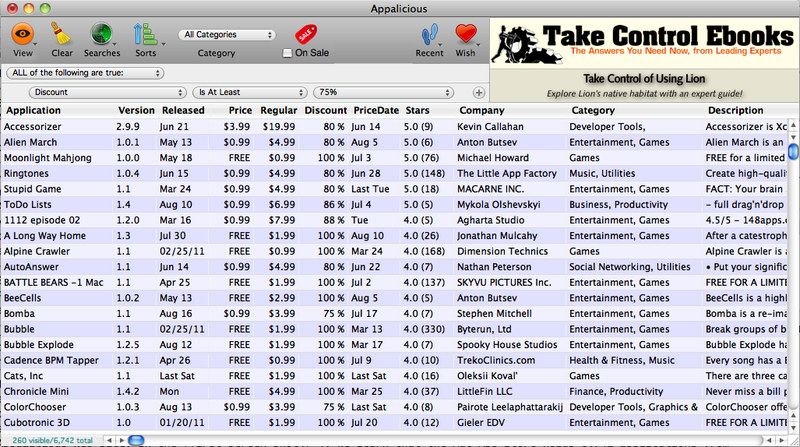 Above all, Appalicious is fun and easy, and it makes the Mac App Store fun and easy. It actually makes me want to download stuff from the Mac App Store! Using the discount history to focus on the best available deals gives me, I must confess, a particular thrill. The pricing for Appalicious is a bit unusual. It’s free for a week after you start using it; after that, the application doesn’t stop working, but the linkage between the Appalicious application and the online database is suppressed, so that you are no longer able to obtain up-to-date information about what’s in the Mac App Store. In effect, what’s happened is that you were given an initial one-week subscription to the Appalicious service, which then expires. To extend the subscription, you have two choices. One is to pay, at a rate that is normally $12.95 per year, although coupon codes can lower the price; right now, the coupon code INTRO gives you a year’s subscription for $7.95. Furthermore, if you use the Appalicious interface to recommend Appalicious to a friend who then uses the app (even if they don’t pay to subscribe), your subscription is extended by a month, and your friend’s subscription is extended as well (this referral model is inspired by Dropbox). You can combine a purchased subscription with a referral subscription, and you can accumulate multiple referral subscriptions (up to two years’ worth). Considering how much you can save by judicious use of the information Appalicious gives you about Mac App Store applications and their pricing, this seems a reasonable cost. Appalicious works on Mac OS X 10.4.11 Tiger or later (though we gather there’s currently an installation problem on Tiger that ProVUE is presumably investigating), but of course you won’t actually be downloading any apps from the Mac App Store unless you’re running 10.6.6 or later. Currently, Appalicious displays data only from the U.S. Mac App Store; we suspect support for versions of the Mac App Store in other countries is coming. It is a 23.8 MB download. Your first paragraph suggests that you truly do not understand the purpose of the App Store. The money is not the (entire) point. (But they're a business, so why castigate them for trying to make money?) Control is not the point. The point is making it as easy as possible for casual and novice users to find, purchase, and install apps. Have you ever tried to teach a novice Mac user how to install an app like Skype or Firefox? Ever tried to explain the function of a disk image? The App Store is a breath of fresh air by comparison. It's simple: You are not the target audience of the Mac App Store. Compare to the iOS App Store. I never rely on what's in the store app to discover apps; there are plenty of app review sites and communities out there. Myself, I rely on word of mouth, blogs, and commentary to discover new apps. It's the same for the Mac App Store. That will never change, even if one day the only way to install an app on the Mac is through the App Store. Money IS the entire point for Apple. You think capitalism is more important than the greater good of human beings?? With all the breakthrough tech from Apple, why can't I use my iPhone to share features with my buddies' Android? Why can't my iPad fling over pictures to my HTC like it can with other Apple machines? Because of Money. Apple wants it and they take it. I should be able to access every app available on my iPad. Remind me again how much Apple chews off from other developers hard work? Don't even frakin think you can post a defense for Apple. There are hundreds of ways Apple could improve their accessibility, staunch regulations, open codes, and user friendliness. Awww...poor wittle Apple doesn't have enough money anymore. You seem to be a bright fellow, maybe you can enlighten us by enumerating the hundreds of ways Apple could improve the product and provide specifics on how it can be done? while you are at it, why dont you give a cost in dollars (for all of us who dont understand forex) and manpower associated with developing those improvements. Boy the apple fan boys sure do take this stuff seriously. Anyway, Apple can start by easing up on some of the proprietary demands that they put on their products. This way of doing business worked fine for Sony for a while too, but eventually people wised up. Such is the way of all technologies. Just as the iPhone and iPad are disruptive technologies, so are the VCR and walkman. However I do think Sony and Apple are different, slighty, in this regard. Sony's has had more failures than successes, because their plans are less agile and based around consumer lock in first and customer experience second. Apple puts user experience first, and customer lock in second, and customer lock in primarily came about #1 due to media companies and #2 due to the desire to control the user experience a little. Apple benefits from lock in, don't get me wrong, who wouldn't? However, public reports state that Apple breaks even on the iTunes store, their primary business is selling highly profitable hardware. Content on the iTunes store is cheaper than it once was, which is a benefit to customers. Sony keeps wanting to make you rebuy your movies on more expensive formats, which is not good for customers. You seem content with the status quo- especially with your Forex comment. Welcome to the 21st century pal. Not being able to provide universally accessible software is up to decision making corporations and not because of incapability. You are going to have to be more specific. If you claim Apple can improve the UI of their OS to be even more user friendly, then please cite examples. Otherwise your post off as juvenile. You can't claim humans could make it to Mars in 6 months without providing some backup. Universally accessible is not the same as user friendly, and I believe you meant to say UA not user friendly in your first post. It's true the iPhone is not 100% user accessible, but it is incredibly user friendly. For some, less than 100% user accessible is evil, but for others it's a feature to prevent from shooting themselves in the foot. Some people are stupid, others simply don't have time to figure out every aspect of their phone. they are too busy being engineers, teachers, parents, business leaders, etc. But that's why it's a good reason that there are more than one type of phone out there. This is to and for Chuck T. Wow! Are you hot under the collar. Do you own a business? Try it yourself, (and BTW, try to be honorable in dealing with the developers (suppliers) and your users (customers) and make enough to compete with companies that don't do either of these) then come back here and make a knowledgable and informed statement that does little more than complain. A factual corrections need to be made here. Any other company is free to license airplay from Apple and create an airplay compatible device. While it's true one must purchase a license, which is money, it disingenuous to entirely blame Apple for not making an HTC phone Airplay compatible. Apple has no control over HTC hardware, why would they? Dan, you say the target audience is the Mac newbie; all fine and good. However, why then is Apple making the Mac App Store the sole source for Mac OS upgrades? I PREFER to have a CD/DVD to do reinstallation of the OS if need be; that can't be done if you are required to download the OS from the MAS. An inoperative Mac usually means NO Internet connectivity. I've put up with this asinine system with my iOS devices because at least with them I can do it through iTunes on my Mac, but if the Mac is down then then even my iOS devices can't be updated since to update iOS itself requires you have a working Mac. Of course not to mention the problem when your ISP goes down. I'd rather get my apps from GiveMeApps.com. Not just because they have a better selection of apps, but you can search jobs, chat and developers there get 100% of their profits. There's one way to skin a cat you know what I'm saying? I am guessing you misread the article, no big deal. This article was about the MAC app store vice the iPhone app store. GiveMeApps.com doesn't cover Mac apps. Thanks for providing a link to a new site (for me) to locate other apps, though. Why do they have to charge an annual fee? It seems that if they dropped their fee they could more than make up the loss of revenue by a much higher volume of purchases, which, I assume, the Appalicious folks make 5% off of their Apple Affiliate program. Actually I find Appalicious not as useful as this author says and the Mac App store more useful than they claim. The Mac App store is good for new users who don't know where to look for apps. It's also a very powerful and simple tool for quickly finding an app to fix a problem. My main complaint though is that if you are looking for apps that might fix problems you don't know you have yet, it's hard to browse quickly. Appalicious seems to make it easier, with browsing and sorting features. I'm hesitant however to subscribe to an app like this, simply because there are in fact too many features. This seems to be an app geared towards app reviewers and those who are app addicted, not app browsers like myself. I don't download enough apps to download ANOTHER paid app just to find a few apps. There are a ton of free apps for searching apps on the iTunes store. iTunes and Mac app stores use XML, and other free apps for the Mac app store should becoming soon. I have basically found nothing through the App Store directly. If I have a need, I poke around on the web, read TidBITS, etc. to find out what I want, and then--if it's available in the Mac App Store--I might search for and purchase it there for the convenience of future updates. Basically, I find the Mac App Store's lists to be overwhelming and their categorizations too broad to be anything more than a purchase window. I'm the developer of Appalicious. Dave, the frustrations you feel about the Mac App Store ("overwhelming", "categorizations too broad") are the same ones we had that motivated us to create Appalicious. Appalicious works with the exact same catalog data that the Mac App Store has, but presents it in a way that is much more user friendly. Most of the Appalicious beta testers told us that using Appalicious they almost immediately discovered apps they were interested in that they had never heard of before. Based on your comment I think you would very likely find that in Appalicious we've done the "refining" necessary to make the App Store truly useful, as Matt asserts in the title of this article. I hope you download it and give it a try. Love your app, hate the subscription. App store is difficult, but web reviews in combination with the App store is free to me. Appalicious for the iOS store would be a godsend. Any hope for one? You might note that their web site says the product works only with the US App Store. International customers need not apply. Appalicious will work anywhere in the world, however, the data displayed will be from the US store, and all prices will be listed in dollars. Since most apps are sold worldwide and prices change in sync across the world you can still use Appalicious to quickly browse the app catalog and to find current deals. When you want to purchase or download an app your local version of the Mac App Store will open and you'll see the local price of the app. Depending on demand, we may add native support for additional countries in the future. I have just downloaded Appalicious from the web site and after installing and trying to launch it, it repeatedly crashes. Strangely, their Support page only provides a forum for comments/complaints. It does not provide the kind of troubleshooting service that many other developers provide. Why can't they provide this kind of service? I have just read Martin Taylor's comment about it only working with the US App Store. Since I live in Thailand, that answers the question. However, that begs the question "When will it be available for international app stores?" Can Jim Rea give an answer to this? We do provide troubleshooting service thru our forum, as many other developers do. Using a forum makes the process more transparent and hopefully reduces the need to answer the same questions over and over. I've already responded to your question on the forum. Before I'd even consider paying the subscription price for Appalicious, I'd have a look at appshopper.com (free) or Apps on Sale (currently $4.99 at the App Store) or AppyDays (currently FREE at the App Store). Just my 2¢. The app has the charm of OS 9. The overview is a bit better than the AppStore. But the app hang before I could do much.